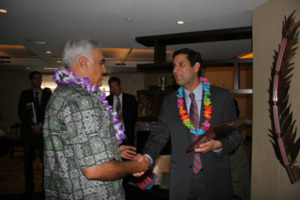 This will be my final blog entry as Program Executive for Data.gov, as I am departing to become the Chief Information Officer for the State of Hawaii. There, Governor Abercrombie and I will work together to bring Hawaii’s data forward and look at ways to continue to collaborate with this team and with all of you. In Hawaiian, “Aloha” means many things, including “Hello,” “Goodbye,” and “Good luck,” so as I depart for the Islands, I wish all of you a fond farewell and the best of luck in the future. The last few months have been busy and exciting ones for Data.gov. We continue to make great strides in technical capability and outreach efforts to spread the message of open government data. Data.gov has achieved an overall rating of 9.9 out of 10 on the IT Dashboard, one of the highest in federal government. We have also received numerous awards, such as being named a finalist in the 2011 ACT-IAC Excellence.gov awards, and being named to CIO Magazine’s annual CIO 100 Awards, as one of the 100 innovative organizations that uses IT effectively to create business value, one of only 4 awarded to the Federal government. In May 2011, Data.gov launched Data.gov Next Generation, which transforms the site from simply an online catalog to a cloud-based data services platform that provides benefits in the areas of citizen experience, developer enablement, and agency empowerment. Rather than going to another site to download the data, you can get to the data right away to analyze, sort, group, and visualize the data live, via the cloud. Click here for an example. Transforming data into information puts the data to work, allowing citizens to be more informed, make better decisions, and derive greater value from their government. The datasets on the new platform also feature an open application programming interface (API), making it easier for developers to mash up data and create apps. For fans of the old Data.gov, fear not! The “Classic” version of the catalog will remain available and continue to be updated as new datasets are added. We continue to add to Data.gov Communities, which provide citizens, government, researchers, and industry with a forum to share ideas and feedback about data on topics that are important to the American public and that tie into the missions of many agencies. Communities provide discussion forums and opportunities for collaboration and innovation among data consumers, and help to make data more accessible and more relevant by giving users a view of the catalog tailored to their particular interests. 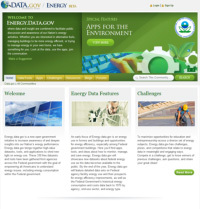 On June 30, 2011, we launched our latest community, Energy.Data.gov. The Energy Community is aimed at increasing awareness and improving insight into our Nation’s energy performance, bringing together datasets, tools, and applications using data about energy and how it is used. Data about alternative fuels, energy efficient buildings, and how to conserve energy at home are available to empower Americans to understand energy issues, including the energy use of the federal government. These new innovations are a challenge as we have experienced dramatic cuts to the eGov fund and the Data.gov budgets. However, in a new paradigm, these communities and some additional services are moving forward because of reimbursements from agencies that support the initiatives and goals of these new communities. Stay tuned as the Data.gov team, working with other agencies, brings up new communities that focus on the interests of the American public. This summer, we will merge Geospatial One Stop (geodata.gov) into Data.gov to consolidate the Federal government’s two primary data catalogs into one site. Bringing the two sites into one will simplify citizens’ search for data, whether geospatial or tabular, while still providing the same visualization (e.g. mapping) capabilities that currently exist at Geospatial One Stop. The consolidation will also save money by eliminating the need for the technical infrastructure of an independent Geospatial One Stop, and by providing citizens and agencies alike with a single source for all federal civilian geospatial data. In the next several months, Data.gov will continue to transform and grow. Additional Communities are in development, and Data.gov Next Generation will host more and more of the federal agencies’ datasets, so that the government’s data is available in a format that is more useful to citizens, researchers and developers. As Data.gov continues to improve, it will maintain its position as a world leader in open government data. Be part of this journey—explore the data, share what you learn, and help to deliver the power of understanding through visualizations, apps, and analyses. 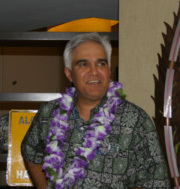 I would like to thank everyone who attended my Hawaiian-themed farewell party for their kind words and best wishes. The event was a wonderful send-off, and I am grateful for the appearance by the Federal CIO, Vivek Kundra, as well as other Department and Agency CIOs who attended. In my time as Data.gov Program Executive, I have had an incredible team of over-achievers supporting me – they are the real heroes and heroines of Data.gov and the Open Gov movement. Marion Royal, Hyon Kim, Alan Vandermallie, and Sally Kiel from GSA, Joey Hutcherson from Commerce, George Thomas from HHS, and Jeanne Holm from NASA have all been key to the success of Data.gov and it has been my pleasure to have worked with each of them. Dr. Jim Hendler from the Rensselaer Polytechnic Institute, and Nick Harrigan, Hiko Naito, and the rest of our contractor team have been superb and provided world-class support. It’s been great to be part of the Data.gov team and the global Open Government phenomenon. Wish Data.Gov will have a better bright future. PLEASE: don’t take too long for preparation of Geospatial Integration. It would be very useful for us. May be it is your final blog entry as a Program Executive, we will always remember your works, your efforts, keep posting to elaborate your ideas and views. Aloha and Mahalo Sonny! Farewell. and looking forward to the geospatial integration. Good luck Mr. Sanjeev whe thank you for everything. Maby you wil remember me. Good Luck and more power! I just discovered this site. I want to say that it is a superb resource. I find it very well organized and I'm prowd that our government shares information like this. Beautiful work and best of luck with your new job. Nice shirt in that pic. Congratulations on your new promotion on becoming the Chief Information Officer and all the numerous awards you have recieved.